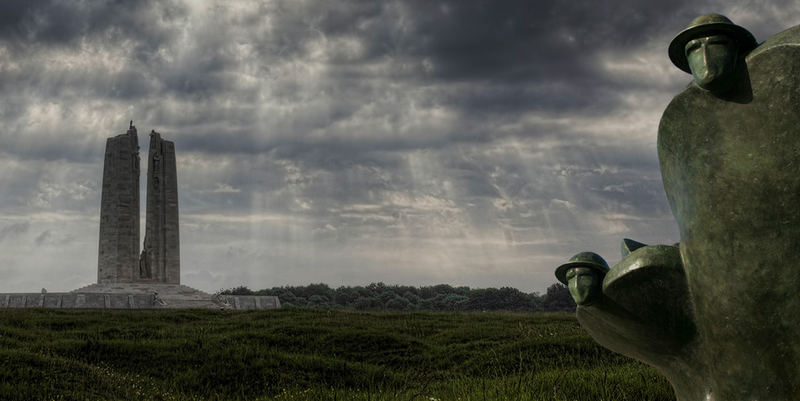 A trip to France is not complete without a visit to the Canadian National Vimy Memorial and the Juno Beach Centre. When planning a trip to France there are so many things to see and do that it is easy to feel overwhelmed by all the options. Many people don’t realize just how close both Vimy and Juno are, or how easily accessible, to major cities like London and Paris. Whether you’re coming from London or Paris and heading to Vimy or Juno, by car or train, find detailed directions using our helpful tools below. Whether you’re coming from London or Paris and heading to Vimy or Juno, by car or train, we’ve got your back. Get detailed directions using our helpful tools below. Take Route A1, going north in the direction of Lille, and drive for 160 kms. After 2 hours, merge onto A26 for 10 km. Take Exit 7 toward Arras/Lens/Vimy and continue onto N17. Drive for approximately 2 km through the town of Thélus. Turn left after the sign for the Canadian National Vimy Memorial. The Memorial will be on the right. 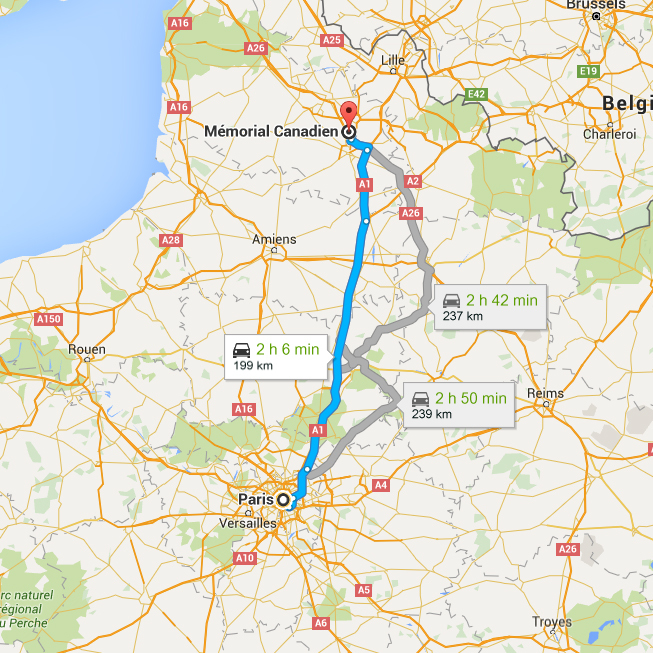 The trip from Paris to the Memorial is approximately 2.5 hours. If you are planning on travelling from Paris to the Memorial by train, we recommend travelling from the Gare du Nord to the town of Arras. For train schedules, and to purchase tickets, please visit the French National Railway Company. In Arras, there is no public transport to and from the Memorial. Taxi services are available for $50 to $60 round trip. For information regarding taxi companies in Arras, consult the Arras Tourism Offices. Note: The train that drops you off at Vimy is actually in the town of Vimy, about 6 km from the Memorial and there is no access to public transit once you arrive. Take Route A13, going northwest in the direction of Caen and drive 225 km. Once in Caen, the A13 merges into the N814. From there, take Exit 5-Côte de Nacre. Drive straight through 2 roundabouts for about 8 km. At the next roundabout, take the fourth exit onto D404. At the next roundabout take the second exit onto D79. At the next roundabout, continue on the D79 by taking the second exit. Turn left at the next street after passing a cemetery and a castle. Continue straight until you arrive at the port. After driving 100 meters, turn right onto la rue Marine Dunkerkque. Once you have crossed the bridge and are in front of the sailing school, turn right. Continue straight until you arrive at the Juno Beach Centre. The trip from Paris to the Centre is approximately 2 hours, 45 minutes. 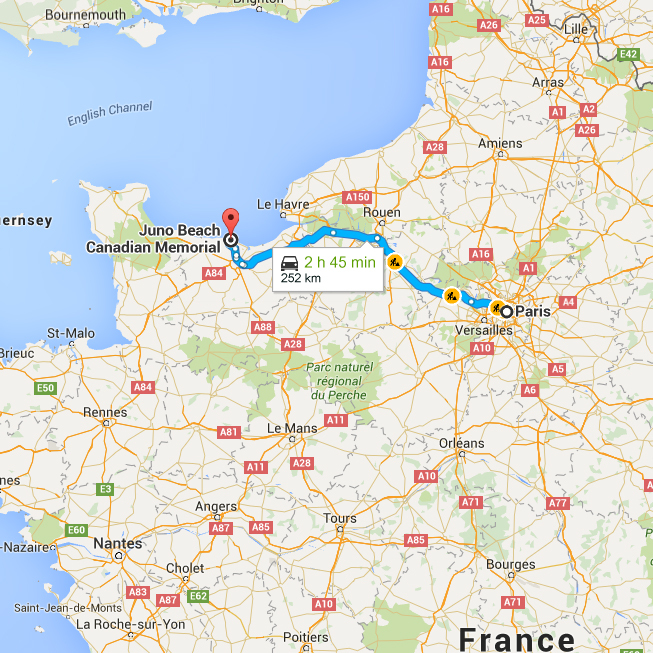 To get from Paris to the Juno Beach Centre, take the TER train from the Gare Saint-Lazare to Caen (approximately 2 hours). For complete train schedules, see here. Once in Caen, Courseulles-sur-Mer is 25 km away. To get to the Centre, you can take a taxi for 30 minutes and at a cost of approximately 40 to 65 €. There is also a regional coach service called Les Bus Verts. A ticket costs less than 4 € and can be purchased from the driver. Please consult www.busverts.fr for timetables and exact fare. It is usually possible to take Bus Number 3, and request the driver drop you off in Courseulles at the Chant des Oiseaux stop. This can take between 30 minutes to an hour. From Central London, follow the A26 and merge onto the M20 (signs for Dover/Channel Tunnel/Maidstone) for 1.5 hours. Cross the English Channel at Folkestone into France at Calais. Tickets can be purchased for approximately 50 pounds per car. From Calais, take the A26 and continue for 160 km. Take Exit 7 toward Arras/Lens/Vimy and continue onto the N17. Drive for about 2 km through the town of Thélus and turn left after the sign for the Canadian National Vimy Memorial. The Memorial will be on your right. 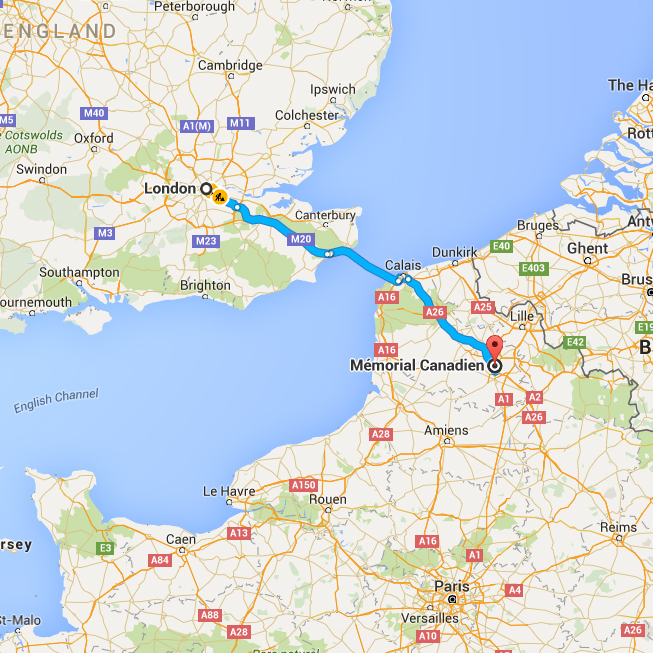 Once in Calais, take the A16 for 275 km and then take the A13 for 55 km, which takes you to Caen. In Caen, the A13 merges into the N814. From there, take Exit 5-Côte de Nacre. Merge onto Rue Jacques Brel and take the second exit at the roundabout, which will take you to the D7. At the next roundabout take the first exit onto D35. Turn left onto D79A. The Centre will be in front of you. It is possible to take a Eurostar train from St Pancras International or from Waterloo Station in London to Gare du Nord in Paris. Travel time is a bit less than 2 1/2 hours between London and Paris. You then need to take a regional train to the Gare d’Arras. Change train stations to take a regional train from Paris Saint Lazare to Caen. From the Memorial, head northwest and take Route D55 then D49 to Thélus. At the roundabout, take the second exit onto N17. Take the A26 exit towards Cambrai/Reims/Calais. Merge onto Route A1/E15. Take the A29/E44 exit towards Rouen/Amiens. Continue on A29, which eventually turns into the A13. 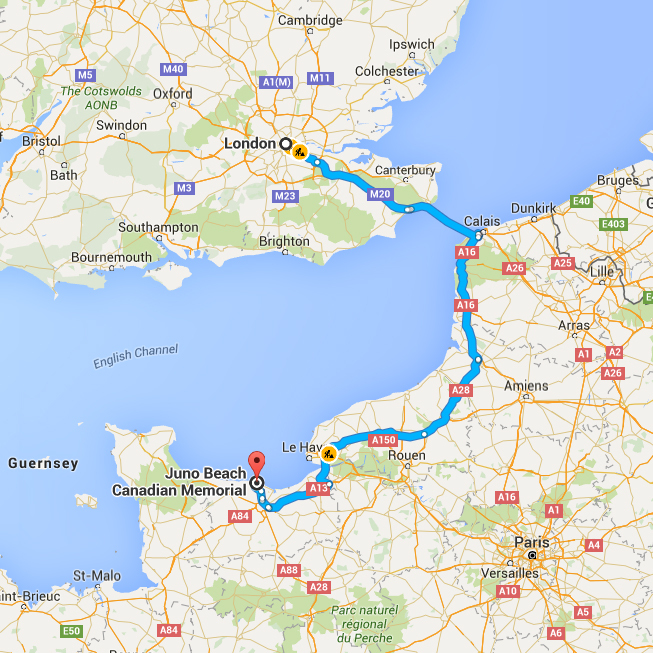 The A13 takes you into Caen, the largest city near the Juno Beach Centre. Once in Caen, the A13 merges into N814. From there, take Exit 5-Côte de Nacre. Merge onto Rue Jacques Brel. Take the second exit at the roundabout, which will take you to D7. Continue straight on the D404 until it joins the D79, and then the D12. Turn left onto l’Avenue du Chateau (there will be signs directing you towards the Juno Beach Centre). The trip from the Vimy Memorial to the Juno Beach Centre is approximately 3.5 hours. In Arras, get on the train at the Gare d’Arras and travel to Caen. The train ticket costs about 40 euros and travel time is approximately 4 hours. Tickets can be purchased on the French National Railway Company’s website. As there is no public transit from the city to the Memorial, a taxi service will be required for about 50–60 € round trip. Once in Caen, Courseulles-sur-Mer is 25 kilometers away. To get to the Centre, you can take a taxi for 30 minutes and at a cost of approximately 40 to 65 euros. There is also a regional coach service called the Bus Verts. A ticket costs less than 4 euros and can be purchased from the driver. Please consult www.busverts.fr for timetables and exact fare. It is usually possible to take Bus Number 3, and request the driver drop you off in Courseulles at the Chant des Oiseaux stop. This can take between 30 minutes to an hour. From the Juno Beach Centre, turn right onto l’Avenue du Chateau until it ends and turn right onto D12. At the first roundabout, take the second exit onto the D79; continue on the D79 by taking the second exit at the next roundabout. Continue on the D79 until you hit the next roundabout; take the third exit onto the D404. At the next roundabout, take the first exit onto the D7; continue straight on the D7 through the next two roundabouts. At the next roundabout, take the third exit onto the Périphérique Est ramp of the N814 to Paris/Ouistreham-Car Ferry. Once on the N814, take exit 1-Porte de Paris and merge onto the A13 for 50 kilometers, then take the A29 exit towards Le Havre/Amiens/Calais and drive for 68 kilometers (keep right at the fork and continue on the A29/E44 for 40 kilometers). Merge onto A28, then take the E44/A29 exit towards Reims/Lille/Amiens. Take the E44/A29 exit toward Reims and continue onto the A29/E44 for 10 kilometers. Keep right to stay on the A29/E44 for 33 kilometers and take exit 53 to merge onto A1/E15/E19. Take the exit onto A26 toward Béthune/Calais, and then take exit 7 toward Arras/Lens/Vimy. Keep left to continue toward the N17, merge onto the N17 and follow signs for Lens/Thélus/Vimy. At the next roundabout, take the 2nd exit onto Rue des Artilleurs Canadiens/ D55. Follow the D55 and signs for the Monument. The Monument will be on the right. 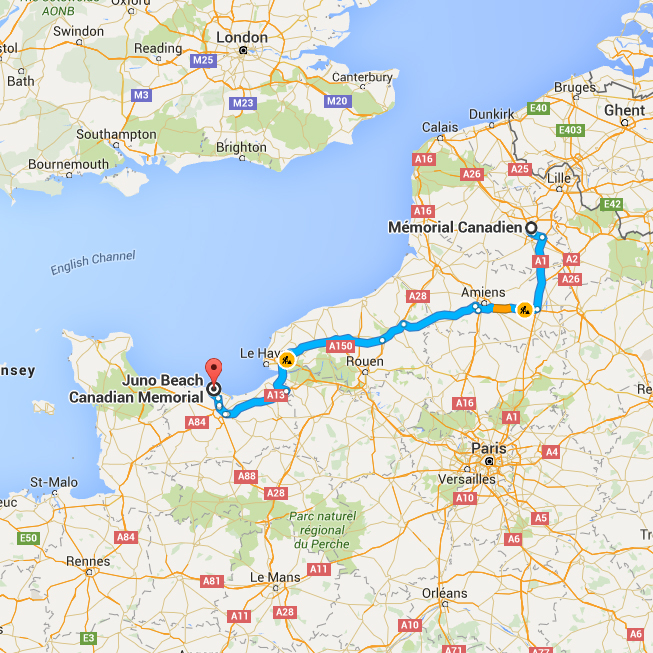 The trip from the Juno Beach Centre to the Vimy Memorial is approximately 3.5 hours. If you are planning on taking public transit from the Juno Beach Centre to the Vimy Memorial, we recommend taking the regional bus service (called Bus Verts) from Courseulles-sur-Mer to Caen. A ticket costs less than 4 euros and can be purchased from the driver. Please consult www.busverts.fr for timetables and exact fare.It is usually possible to take Bus Number 3, the bus would pick you up at the Chant des Oiseaux stop. The bus will drop you off near the train station. From the train station in Caen, take the train to the town of Arras. The train ticket costs about 40 euros and travel time is about 4 hours. Tickets can be purchased on the French National Railway Company’s website. Once in Arras, there is no public transport to and from the Memorial. Taxi services are available for $50 to $60 round trip. For information regarding taxi companies in Arras, consult the Arras Tourism Offices. The town of Arras (about 20 minutes from Vimy) can be used as your home base during your time at the Memorial. Please visit their website for hotels, restaurants, and tourism information. The Commonwealth War Graves Commission is located near Arras and is responsible for maintaining the graves of over 1.7 million war dead in 154 countries. The Carrière Wellington is a museum in Arras that provides guided tours of underground tunnels that were dug in preparation for the Battle of Arras during the First World War. Beaumont-Hamel Newfoundland Memorial (located 30 minutes from Arras) is run by Veterans Affairs Canada and offers tours throughout the day. The Thiepval Memorial is located near Beaumont-Hamel, and was built to honour British and South African soldiers who died in the Battle of the Somme. The site of the Dieppe Raid during the Second World War now includes Commonwealth cemeteries, museums, and a château. The towns of Caen and Courseulles-sur-Mer can be used as your home base during your visit to the Juno Beach Centre. For hotels, restaurants and tourism information, please visit the Normandy Tourism Website. Drivers are encouraged to have change ready for the numerous toll booths. Speed limits in France are 50 km/h in residential areas and cities, generally 90 km/h on secondary roads, and 130 km/h on the highway. The Eurostar, ferry, and planes can also be taken to get to the Memorial or the Centre. For more information, visit the Veterans Affairs Website, or the Juno Beach Centre’s website.